The ‘Skill Development Program of Intern Accountants’ is an important component of the Degree Program, which has been designed for the development of essential skills of the accounting undergraduates. These skills will enable them to secure employment opportunities in the fields of accounting, financial management and business management both nationally and internationally. This program is conducted under four-course units in the third and fourth years of the Degree Program (refer Table 2.1.1). The course units are designed under four sub programs aimed at developing four types of skills, namely; Accounting and Financial Management Skills, Management and Personal Capacity Skills, Communication Skills, and Knowledge Seeking and Learning to Learn Skills. Accounting and Financial Management Skills are subject specific skills which are developed through the two-year Internship Program in Accounting and Financial Management. Under this program, students are placed at both private and public sector organizations under a supervisor who holds professional qualifications specified by the Department. The Internship Program provides practical knowledge in Accounting, Auditing, Taxation, Finance and Management to students in order to apply their conceptual understanding in a real work setting. Management and Personal Capacity Skills include skills such as adaptability, negotiation, interpersonal, team working, time and stress management, problem solving, and leadership. Further, this sub program aims to develop qualities such as integrity and ethical conduct among the undergraduates. These skills and qualities will be developed through the projects organized by the Accountancy and Financial Management Association (AFMA), the students’ body of the Department, the skill development workshops, and the work life at the organizations in which undergraduates undergo the Internship Program. Communication Skills mainly focus on the reading, listening, writing and speaking skills in English language. These skills are developed through self-learning English language packages installed at the Skill Development Centre (SDC), the language laboratory of the Department, supported by special communication skills development sessions. Through these self-learning packages, communication skills are developed alongside the IT skills. Knowledge Seeking and Learning to Learn Skills focus on the skills such as critical and creative thinking, analytical ability, enquiry and research orientation, and commitment to life-long learning. These skills are developed mainly by participating in the ‘Knowledge Seeking and Learning to Learn’ sessions, carrying out a study related to some aspect relevant to positive and critical research in accounting, making a presentation on the study and preparing a research paper based on the study. 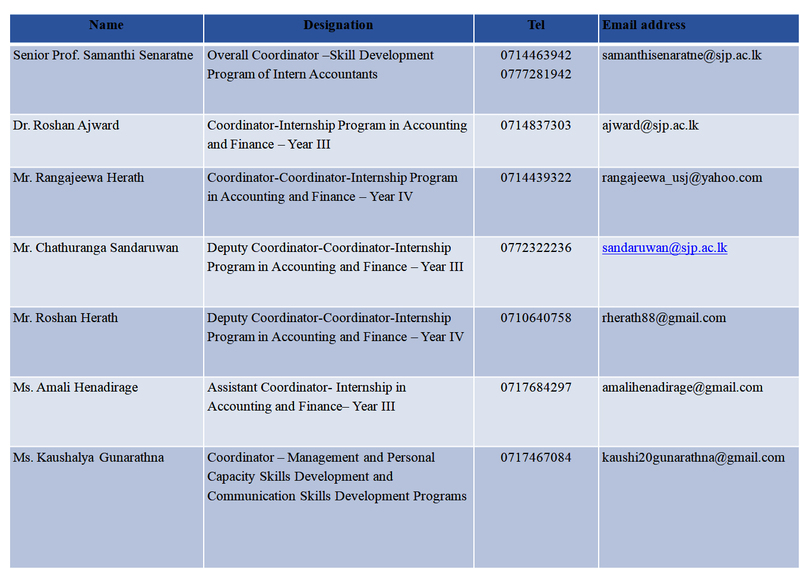 The selected papers are published in the Journal of Accounting Panorama, the student research journal of the Department.